There are several steps you’ll need to take before we can begin the actual work of implementation in the Creation Kit. 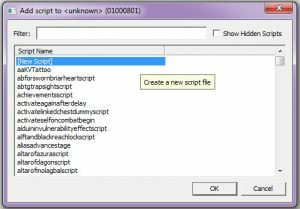 If you’ve done any work with scripts in the Creation Kit, you may have completed some or all of these steps already – feel free to skip any you’ve done already. 1. 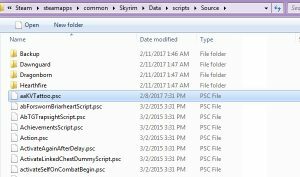 You’ll need to extract the source files for the vanilla Skyrim scripts into your Data folder. These files are included with the game installation, and are stored in a file called Scripts.rar in your Skyrim/Data folder. If this file is not there, or you’ve previously deleted it, you can recover it by verifying your game cache through Steam. Open this file and extract the contents into your Skyrim/Data folder. If asked to overwrite/replace any files, select no – you don’t want to overwrite any files added by installed mods or by a previous installation of SKSE. 2. If you don’t already have SKSE installed, which is unlikely if you’ve previously used Racemenu, you’ll want to install it now. It’s also worth noting that if you installed SKSE via its installer, there’s a chance it may choose not to overwrite certain vanilla script sources. If you encounter compiler issues later in this process, try manually reinstalling SKSE. 3. 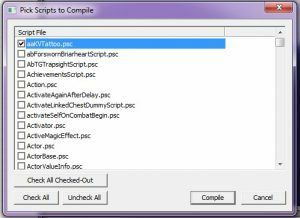 Download the Racemenu Modders Package and extract the contents into your Skyrim/Data folder. 1. Open the Creation Kit. You do not need to load Skyrim.esm. 2. On the top bar, go to Gameplay -> Compile Papyrus Scripts. This may take a moment to load. 3. 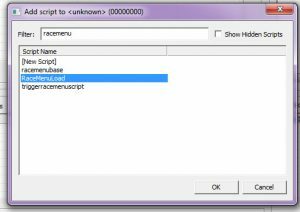 Scroll through the tediously long and unsearchable list until you find “RaceMenuBase”. 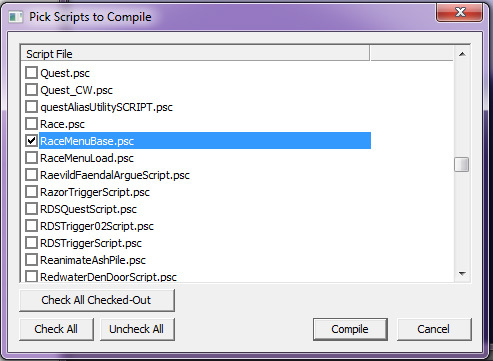 Click the checkbox next to it, and then click “Compile”. 4. If everything compiles fine, open the compiler again and scroll until you find “RaceMenuLoad”. Click the box next to it and then compile it. 1. On the left side panel of the Object Window, navigate to the “Quest” section. 2. In the right panel of the Object Window, right click on an empty space and select “New”. 3. On the first tab, “Quest Data”, give your quest a simple name. This won’t appear anywhere except the Creation Kit, and simply allows your body paints to be loaded in the game. 4. Go to the Quest Aliases tab at the top of the quest window. Right click somewhere in the empty fields and select “New Reference Alias”. 5. In the Alias Name, type “Player”. 6. 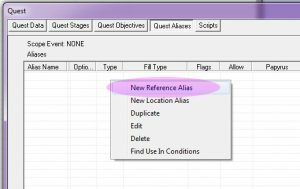 Click the radio button for “Specific Reference” and then click “Select Forced Reference”. In the dialogue that pops up, select “(any)” as the cell which should auto-populate PlayerRef into the Ref field. 7. 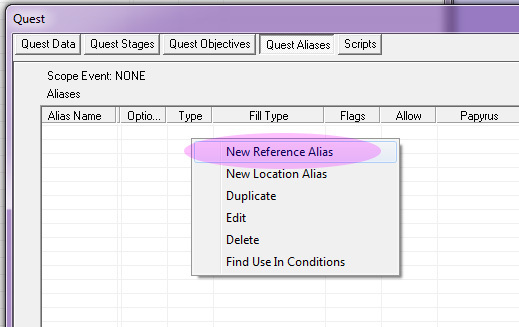 Click “OK” on the Reference Alias window. Curiously, if you try to add a script before doing this, the CK will crash. 8. Double click the reference alias you just created to reopen it. On the right side, under Scripts, click “Add”. 9. 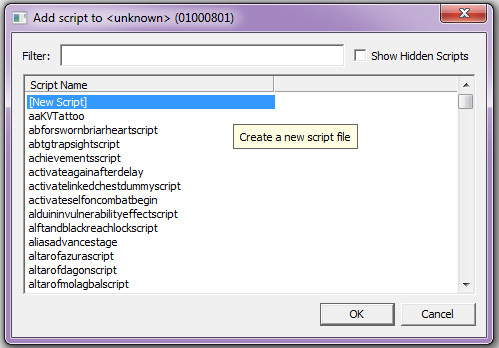 Type “racemenu” into the filter bar at the top of the scripts dialogue, and find “RaceMenuLoad”. Click it in the list, and then click OK.
10. Click OK to close the reference alias window. 11. 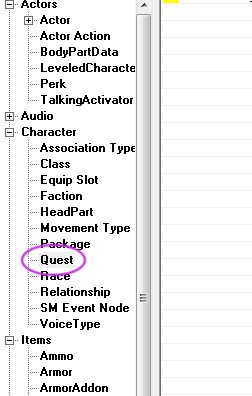 Go to the Scripts tab at the top of the quest dialogue and click “Add”. 12. On the dialogue that pops up, select “[New Script]” at the top and click OK.
13. On the new window, give your script a name – preferably something that will be easy for you to find in that long list with no search feature we previously navigated. 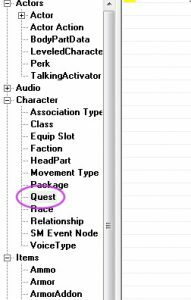 In the Extends field, enter “Quest” for now. 14. Click OK on both of the script windows. 1. We’re now going to create a simple script to tell Racemenu how to find your new overlay. Navigate to your Skyrim install folder. 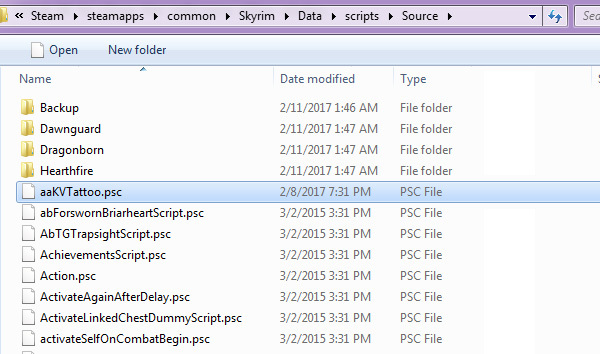 Once inside the Skyrim folder, go to Data/Scripts/Source. You should find a file with the same name as the one you created in step 13 above. 2. Open that file in your text editor of choice. 4. You’ll need to make a few changes to the above script. 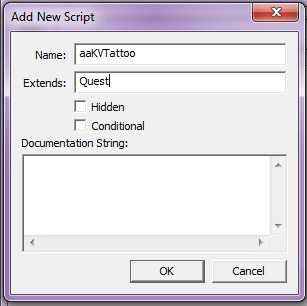 For “YOURSCRIPTNAME”, replace it with the name of your script as it appears in the file – the same as the name you gave it in the Creation Kit. For “NAME OF BODYPAINT”, this is the descriptive name that will appear in the Racemenu list of overlays – numbers and spaces are fine. It’s best to choose something that will help users find your paint easily, for example, “Skeever Back Tattoo”. For the file name and file path, update these to match the location and name of your file. 5. Save your script and go back to the Creation Kit. Your script added to your quest. 6. Click OK on the Quest dialogue to close it. 7. 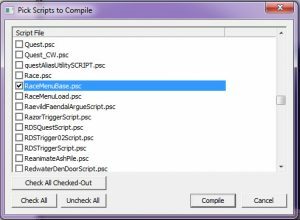 Open the Papyrus Compiler window again (Gameplay on the top bar -> Compile Papyrus Scripts), then find and select the script you just created in the list. Compile it like you have done previously. 8. Click the Save icon in the top left corner of the CK window. Give your plugin a name – this will be the name of the mod’s ESP that will be loaded into the game – and click Save. 9. Activate your ESP through your mod manager of choice, navigate to the proper tab in Racemenu, and test it out! Hi, i’m finding this very useful and easy to follow, thanks for that! I’m having a problem however where Creation Kit crashes (surprising, i know) on step 6 of Create Your Script section, right after i edit the script manually i go to CK, click OK on the Quest Window, it freezes for a few seconds and Stopped Working message. I’ve followed every step with precision and i know that CK is really buggy but i’m not that familiarized with it so i don’t know about common workarounds and stuff like that. Anything you can suggest me to do? I hope you can help me, i’m so close to get my first overlay in game xD Thanks in advance! 1. Create the quest, save it, and save your plugin. Then try adding the script after that. 2. Create a duplicate of the quest that crashes when you try to add the script, then try to add it to the new (duplicated) quest. Let me know if any of those help. My overlays appear too dark. What’s the trick? Try a brighter (i.e. closer to white) for your the visible area of your alpha channel. Thank you very much for this tutorial. I followed everything as described, except that I had to duplicate the quest as mentioned by you in a comment, because otherwise my CK would crash when adding the script and then clicking ok.
No output generated for aasnowskin.psc, compilation failed. I dont know how to fix this, any help would be greatly appreciated. I am really not that experienced with modding, but I think it might have something to do with the fact that I run the CK through Mod Organizer? You would be correct! Mod Organizer cannot compile scripts by default, and will always result in errors because it has issues with 64-bit executables. There is a patcher for it if you’d like to continue running the CK through MO, but I usually just compile my scripts without launching via MO for simplicity. Ive followed this tutorial and re-done everything probably 10 times and I still cannot get it to work. I am not having any CK crashes or any errors. The tattoo’s are just not showing up in racemenu’s makeup section. Hard to guess what might be wrong there – have you enabled the .esp you created through your data files or mod manager? When you load it into the CK, does everything appear in place? I can’t recall what my problem was when I asked for help on here but I figured it out somehow. I just reacalled this because I was working on a new warpaint plugin and came to see if you replied and to thank you soooo very much for your tutorial on how to do this. It was a blessing and helped me tremendously. Thank you! It always fails. It fails for every single compiled script, every single time. No output generated for RaceMenuBase.psc, compilation failed. Batch compile of 1 files finished. 0 succeeded, 1 failed. But, patched or unpatched, it NEVER works. 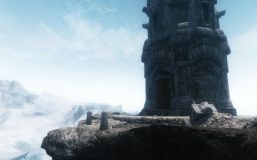 I may be asking a newbie type of question, but this is not my first go at Bethesda modding, nor with the creation kit. (It is the first time I’ve tried the specific procedure. And I don’t know if I’m missing something that is generally known. But Google searches are not helping me. But any help would be appreciated. This error typically means the vanilla/SKSE script sources from your scripts.rar file aren’t extracted into the correct place. The exact order of operations for this is in “Initial Setup” at the top of this part of the guide. Could you double check that all the files from scripts.rar and SKSE are extracted into your Data/Scripts/Source folder? I’m having one primary issue. When I load papyrus scipts, the load fails, preventing me from using RaceMenuLoad on step 9. Any idea? I’m tired of cutesy tattoos and looking to make some that aren’t so blah. Neither race menu compile and it keeps failing. Just re-installed SKSE. Same problem. Any other suggestions? If all else fails, you can do a full reinstall of the skyrim base scripts and SKSE – should ideally fix any conflicts going on there. I go to compile it CK and it fails every time. Any ideas? Could you let me know what error it’s giving when it fails to compile? No output generated for bodyPaintMod.psc, compilation failed. 2. Add a space between the AddBodyPaint and the parentheses for the filename. A minor syntax thing, but Papyrus is picky and has thrown a fit at me for missing or misplaced spaces before. 3. Double and triple check that your file paths are accurate, but that seems unlikely based on the errors you got. I’ve tried everything and looked it over a bunch, but it still fails. No output generated for HFS_Heart.psc, compilation failed. So! I’ve followed all the instructions and my tattoo is not showing up in the Racemenu list. Everything Compiled fine. Everything saved fine. Activated the mod. 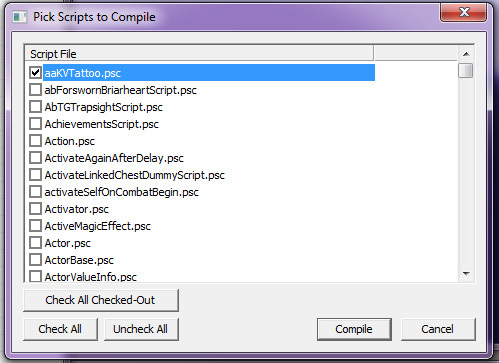 Went into game on a test character to see the tattoo and it’s just not in the list. Getting this error when attempting to compile my script. Everything else leading up to this step is fine, but the final one never works. No output generated for aaBodyPaintSet01.psc, compilation failed. Looks like it might be an issue with the encoding format of your text editor. What program are you using? I’d recommend giving something like Notepad++ a try, and ensuring your encoding is set to UTF8. If that doesn’t solve it, I’d need to see your script (via pastebin or something similar) to further diagnose.